Are you a photographer? Do you have to compile your best work or the shots for a recent project in the form of a PowerPoint presentation? Well, if the answer to both the questions is in positive, you will be happy to know that we are here to help. PowerPoint presentations are a strong visual medium to showcase any kind of data – be it in the form of text or pictures. Exhibiting your photogenic shots in a presentation, you need to ensure the presentation’s design and looks are thematic. Check out our templates! You can also see Real Estate Presentations. 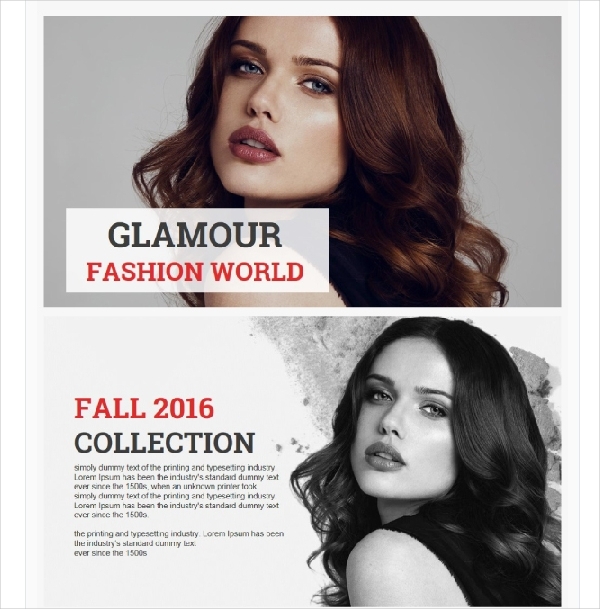 This fashionable PowerPoint presentation template is wired with all the trimmings for you to display the snaps of your high-fashion photo shoots. 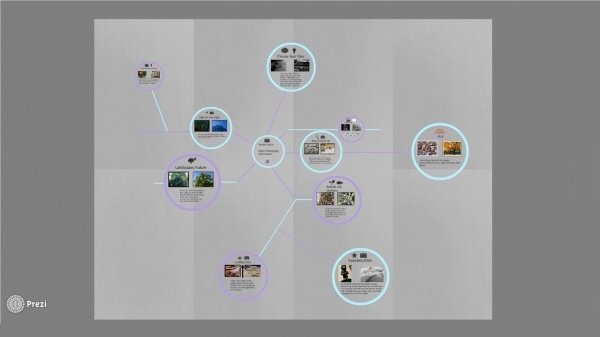 As you can see, this presentation features a magazine page layout. The template contains 20 high quality premade templates which can be edited and readied in a jiffy! You can also see Corporate Presentations. 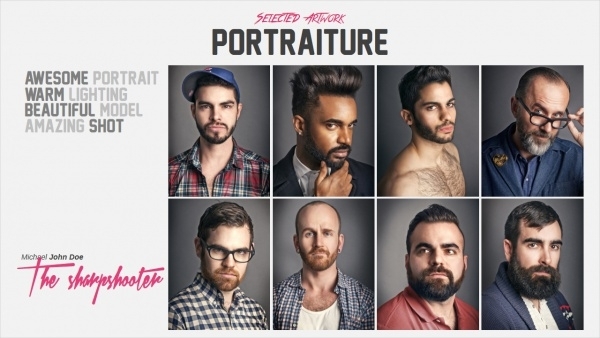 Share your photography portfolio with confidence and style. 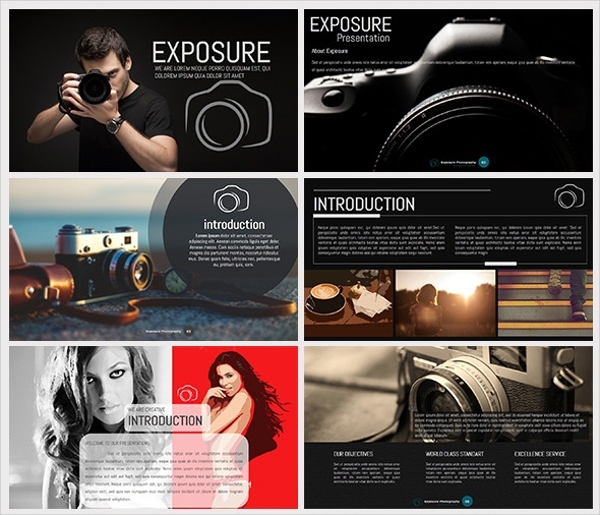 This is a professional Photography free theme which has a DSLR camera on the master slide. 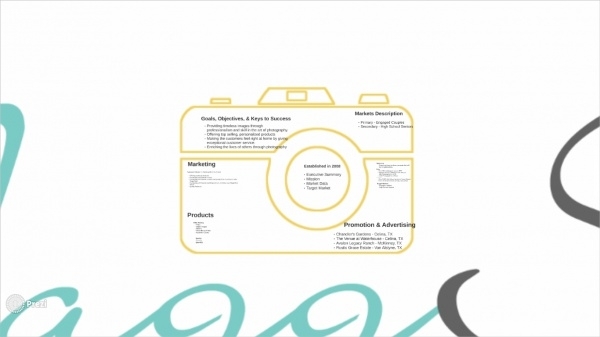 If you have to share your views and tips on photography via a presentation, let this template be the choice! You can also see Powerpoint Presentations. 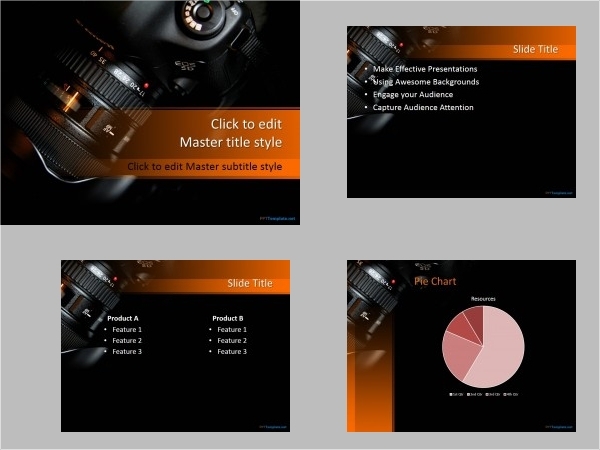 This presentation template is loaded with the looks and feature which fit best for corporate and business presentations. Give your photography shots a more professional look by compiling them in the slides featured in this presentation template. 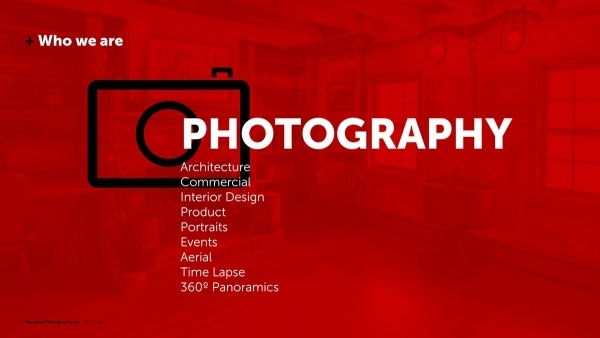 With 40 unique slides, 20 predesigned templates , a total of 2400 slides, any photographer is going to have a field day creating a PowerPoint showcase of their work. 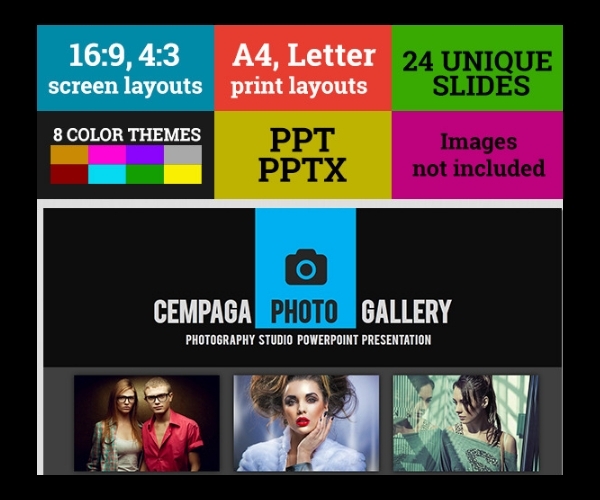 The template is also loaded with 4000 icons and 72 color themes. Animation effects also included. 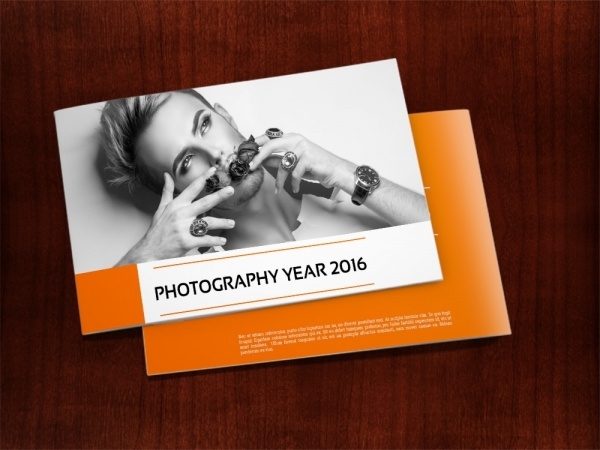 This photography presentation template is another attractive alternative which you can use. This one is loaded with 30 slides, free fonts, and lots more. There is also a Quick Tutorial which is included to give assistance to the users. This presentation template has a display resolution of 1920×1080 pixels and it is wired with great looks. 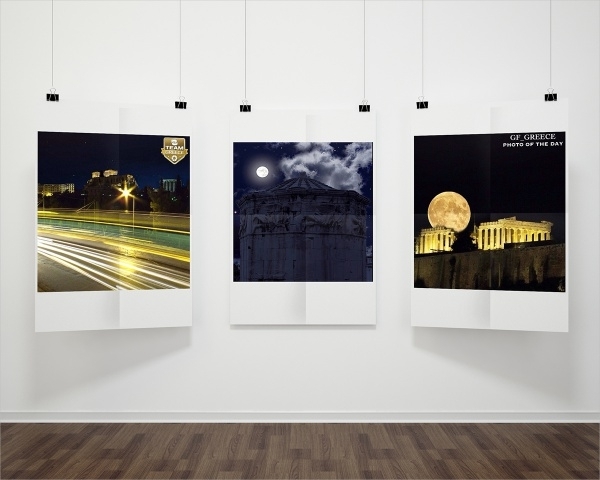 This is a versatile presentation sample which can be used for displaying all kinds of photography. 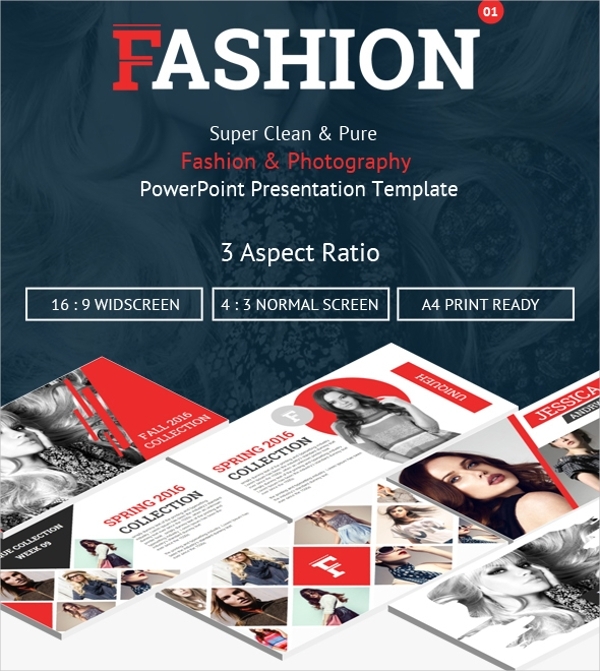 If you’re a fashion photographer and you need a presentation template that is readily loaded with clean and modern design and features, we recommend you to download this template right away! 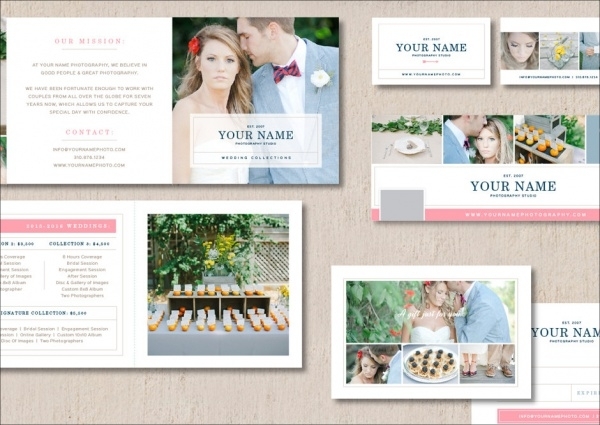 The design is crafty and the template is packed with features to show your photo gallery in the best way possible! If you’re looking to show how well your photographs would appear when placed on different objects – this template is perfect for the cause. This template allows you to show clients your photographs on a business card, thank you card, Facebook Timeline template, and much more. Be it a photographer or a graphic designer, even if you’re a creative studio or agency, this stunning and artsy presentation template pulls out all the plugs of design and functionality to give your work the representation it needs. This is another interesting fashion photography presentation design sample. Loaded with multiple options and features, any user can easily assemble their best fashionable works into this template and show to clients. 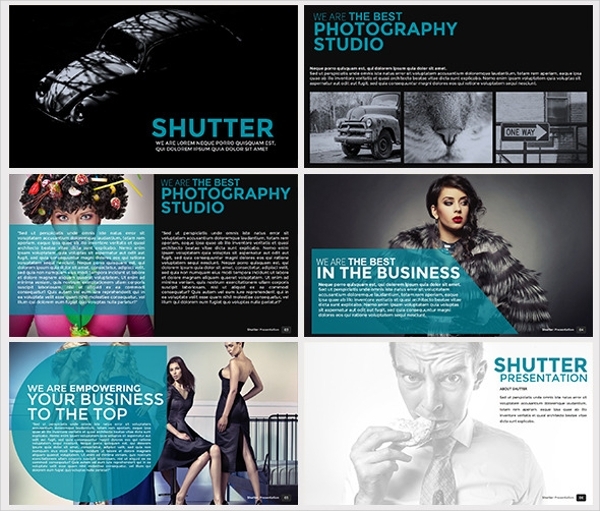 Be it a simple photography portfolio or a photography business pitch, this presentation is just apt for you. You can not upload pictures but videos as well. Loaded with looks and smart objects, this well-designed presentation template is created to cater to the needs of travel photographers that need to show their travel shots to clients or customers. If you’re a photographer who captures shots in studios, well, then there cannot be a more well-suited presentation design sample than this to show what you do best. 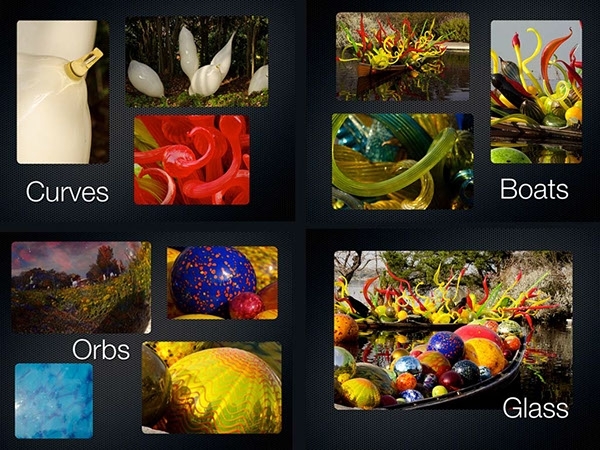 Customize the predesigned slides with your choice of pictures and text. If nature and landscapes photography are your specialties, then we’d totally push you to show your best shots on this presentation design template. You can arrange your pictures in an interesting manner. Showcase your natural photography’s best works in this presentation sample. The design and layout are plain, simple and classy. It has all the features to let your photographs do the magic on the screen! Photography is a special talent and photographs are a possession of sorts. In order to make them a good impression on clients and customers, a well-designed PowerPoint presentation is very necessary. 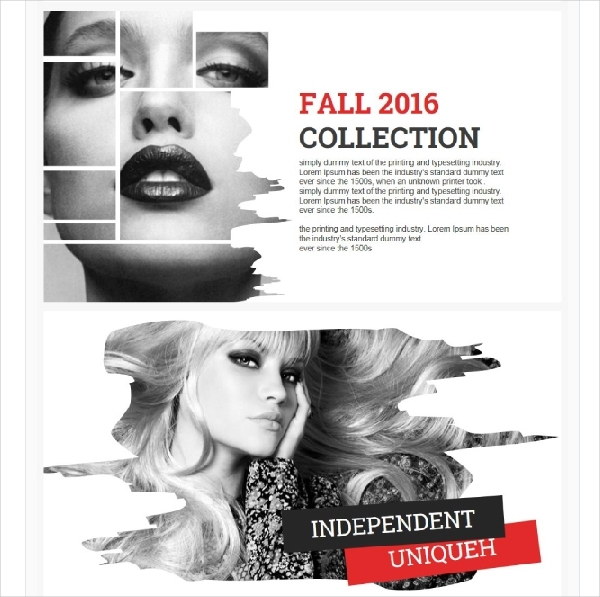 In the aforesaid compilation, we have collected the best templates that users can easily download and work with!